These Sunbird teardrop banners are a great way to attract shoppers and advertise your business! This flag banner stands 9 feet tall with a flexible pole that keeps the fabric taut and readable at all times. Custom printed with your design, the flag banners are a polyester mesh material printed dye sublimation, hand stitched, and made in America. The single sided flag images are printed on one side and the ink bleeds through the mesh fabric to the backside of the flag. Logos, images and text will be visible on the back, but will read in reverse. The double sided flags read correct from both directions; this is a good option if your graphic is complex or for indoor applications. 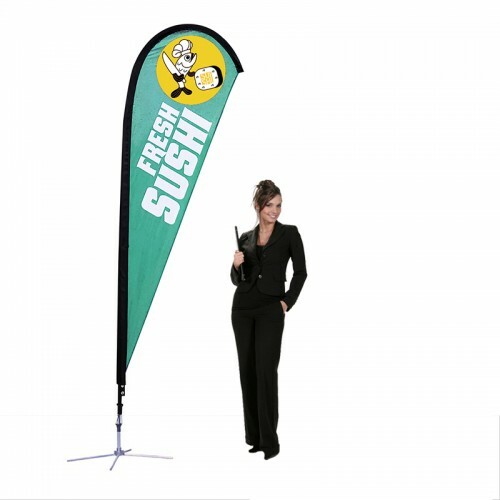 Teardrop flags with a cross base are tall and shapely making them very effective for store fronts, sidewalks, festivals, indoor applications or any hard surface. You can add the spike base for in-ground applications.